In the USA, it's National Poetry month. The kidlitosphere is buzzing with poetic excitement and there are some amazing blog posts. Gregory K announced 30 Poets in 30 Days on his Gottabook blog. So far, I've read and loved previously unpublished poetry by Jack Prelutsky, Rebecca Kai Dotlich, Charles Ghigna, X.J. Kennedy, and Ann Whitford Paul. This is an amazing opportunity to get to know poets you may not have encountered before, and just to celebrate with others who love poetry. Tricia at The Miss Rumphius Effect has posted some wonderful interviews with poets in her series: Poetry Makers. I love Tricia's questions which lead to so many fascinating insights. The description of The Underwear Salesman: And Other Jobs for Better or Verse has me drooling. It sounds like a great book of poetry for kids who love word play. Amy Planchak Graves hosted Poetry Friday at the start of National Poetry Month. At ayuddah.net she has gathered heaps of great links to posts related to poetry. Do you have a budding poet in your family? Anastasia Suen has a new blog called Pencil Talk. She encourages students K-12 to send in their own original school poems and she will publish one each day. It's great to see kids creating with language like this. Some of my own must-visit poetry pages include Michael Rosen's Poetry Friendly Classroom - advice and resources for teachers; Carol Hurst's list of nine books of poetry she'd want in a classroom; Gigglepotz - poems and learning how to write them. Does the BookChook have a favourite children's book of poetry? 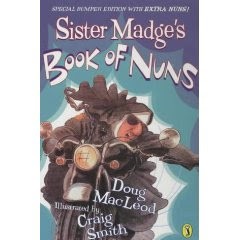 Sister Madge's Book of Nuns is also a picture book, so I guess it's no wonder the pages are dog-eared. Written by Doug MacLeod (Australians might recognize his name as a script writer for Kath and Kim), and illustrated by Craig Smith, it was much loved by the Year 4-6 kids I taught. Pick of the bunch was Sister Stephanie and the Gang. When a supermarket manager insults a nun, she returns to wreak vengeance. The nuns had formed a bikie gang." With two fish-fingers up his nose." How could a primary school student fail to be enchanted? I own about one hundred books of children's poetry, but each time I see the spine on this one, I remember 30 grins and eyes lit with glee. Poets rank up there with choreographers on my creativity scale. To me, poetry is a solace, an energizer and an enlightener. I am constantly grateful for an education that introduced me early to poetry, taught me reams of it by heart, and gave me the desire to discover more of it as often as I can. Where does poetry rank in your life? Do you have a favourite book of poetry or poem? Poetry doesn't get the credit it's due, and it can be so fun and enjoyable to kids and adults, alike. We've just discovered Jack Prelutsky, and always try to put a little poetry in our lives, and look to music as a way to get a poetic dose each day. Thanks for the post. Terrific post with valuable info...thanks! I'll be passiong your blog onto several writer friends. Thank YOU for the tremendous amount of work you've done Greg, to make this 30 Days of Poetry such a success. I'm glad you like Jack Prelutsky too, Fred. Hope you and the kids take a look at some of the other poets on 30 Days of Poetry at Gottabook. Poetry ranks high in my life! I have a shelf full plus a towering bedside stack full at home and several shelves full at school. It's one of my missions in life to show kids there is more to poetry than Shel Silverstein! Great, Annie! Best of luck with the speech comp, too!